I've spent the last week doing inspections in Kewaskum, Wisconsin. It's a small town north of Milwaukee, a two and a half hour drive one way. I've been fortunate that I can arrange the inspections to start at 10 and end around 2:30 so I can drive up and back each day. Yes, it's been hard on my body but I would rather sleep in my own bed. I think 3 hours one way would be the limit for me, although I have driven to Iowa and back simply because of the work load. It makes for a long day, but being with my girls is worth it. 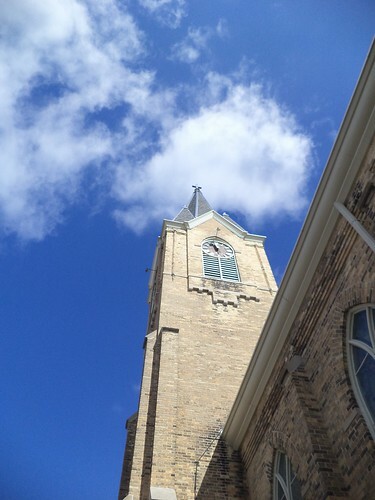 One of the buildings I had to inspect is Holy Trinity Catholic Church. It's a beautiful building. It was built in 1905. The addition to the left was added in the 1990's. It includes the handicapped entrance. The congregation has done a fantastic job of maintenance. You can tell they love the building. As I approached it, something struck me. This architectural design is extremely familiar to me. If you go into any upper Midwest town of 1000 or more, you'll find a church that looks like this. It doesn't matter if it's Catholic, Lutheran, Methodist, Presbyterian or whatever, there is a church that looks like this. 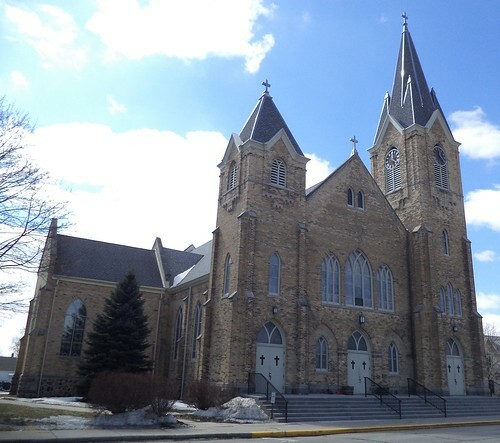 The priest said that was an interesting observation because the United Church of Christ and the Lutheran church in town do look like this. They don't have the bell tower, to the right, but they do have a spire and a high, vaulted ceiling. Interestingly, they were built between 1905 and 1908. East of town is a small white, clapboard Catholic church that, I swear, is the spitting image of the Lutheran church I went to until we outgrew it and built the new church. You see that design around, too. So I got to thinking, was there an architectural firm around between 1880 and 1920 that specialized in church design? In my hometown, we had a Methodist and Catholic church with similar designs. If you took off the bell tower and shrank the church by 20%, and built it in dark brick, you'd have those two churches. Did you page through a book of prints or floor plans, adapting designs or did you just choose something you liked? They didn't have photography to send you a book of 8 x 10 glossies for your congregation's perusal. And then, is this a typically Upper Midwest design? I'm so familiar with this style. It's all over Wisconsin, Minnesota, northern Illinois and Iowa. Perhaps this goes east, too, but I'm less familiar with churches outside this area. I love the majesty of the building. I love how it soars. I wonder if someone has written a book about this style of architecture, investigated it. It would have limited appeal, but the questions fascinate me.